In today’s troubled modern world, a common complaint is prevalent amongst the downtrodden masses: why aren’t there blindfolded taste test commercials any more? These used to be some of my favorite commercials as a child. Granted, I had no disposable income and my parents didn’t buy almost any of the products being advertised, so I wasn’t exactly their target market. Although they were entertaining to me, so as long as they know they brought joy to a child, then I’m sure the marketing department would consider their mission accomplished. Or not. The soda taste tests were probably the most common, “Take the Pepsi Challenge” being arguably the most successful of these campaigns. The Pepsi Challenge involved, presumably, being challenged to drink Pepsi. I don’t consider myself especially brave, but when forced to make the decision as to whether or not to drink a free can of Pepsi, I know when it’s time to step up and be a man. I have theories on when it’s time to step up and be a woman, but they are still mostly in the hypothetical stage. There were countless other taste test commercials, showing untold of levels of creativity, resulting in some of the most memorable advertisements ever. Unfortunately, I can’t think of any. What sparked my totally interesting introduction was my receiving of a package in the mail. It was somewhat heavy, had a vague return address, and made sloshing noises when I moved it around. If I have no idea what is inside a box that was mailed to me, I certainly don’t want to hear liquid moving inside it. Despite the very possible danger that I was facing, I boldly opened the box. What I found inside shocked and amazed me. A soda taste test challenge kit! Before diving into my overwhelming emotional reaction to receiving this, let us explore the kit. It is packaged in a relatively attractive, and fairly heavy package. Upon opening the top flap, you discover why the package is so heavy: it contains three full sized cans of soda. Pepsi is up to their old, awesome tricks again. This kit is designed to prove that Diet 7-Up tastes better than its diet lemon-lime competitors. They are so sure of this fact that they included a can of Diet Sierra Mist and Sprite Zero. They did not include a can of another diet citrus soda, Fresca, because they knew Fresca would annihilate the competition. And being that Fresca is a Coca Cola product, Pepsi knew better than to include a front runner such as that. Truthfully (as opposed to much of what I usually say), I never cared too much for 7-Up, diet or otherwise. I knew it best from appearing in the book “George Shrinks”, where a bottle of “Yup” soda appears, so they could include a well known soda and not get into legal trouble. Although any company that would have dared sue the author or publisher of a book as incredible as “George Shrinks” would have become one of my most despised adversaries. I also know 7-Up from the revamped version that died quite quickly: dnL. I honestly don’t know much about dnL; I never tried it. I think it may have contained caffeine. All I know is that it spells 7-Up upside down. That’s not actually all I know, I also know that dnL looks similar to dnA, and the idea of drinking DNA is too repulsive to describe. 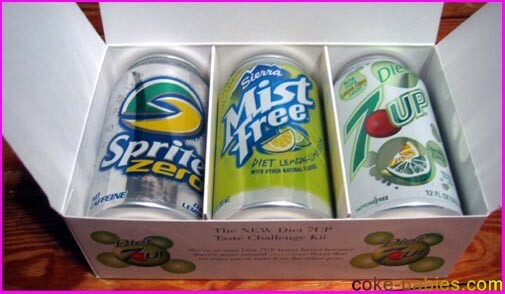 I am more familiar with Diet 7-Up’s mortal enemies, Sprite Zero and Diet Sierra Mist. I drink Sprite Zero whenever there’s nothing else around. Granted, that isn’t the greatest endorsement, and if I was famous they wouldn’t use that sentence in a blurb on their end of year fiscal reports. However when I do drink it, I enjoy it. I guess that’s about as positive a review as Sprite Zero is going to get. Diet Sierra Mist got off to a MUCH worse start for me. The first time I had it was at Taco Bell, and it tasted like grass clippings. Literally. The second time I had it was due to limited options at a Nassau Coliseum refreshment booth. Now, anyone familiar with the Nassau Coliseum knows that calling it a dump is paying it a compliment. Even still, one would think the shortcomings of a building wouldn’t trickle down to the sodas. Unfortunately, the soda I got tasted like nothing. Either the syrup was running low, or they just buy discounted factory seconds, but the soda sucked. It tasted like that creepy lemon-lime seltzer water my family drinks, except… thicker. I got stuck having to have a can of Diet Sierra Mist another time, again due to limited options. I discovered that the soda itself isn’t bad at all, I just had bad experiences with suspicious fountains. Despite my love for taste tests, my first reaction to receiving this package was not one of outright happiness. It was more of a “What in the hell…?” emotion. This was mainly due to the burning question: why was this sent to me? I know that many businesses have access to my address, but that’s still odd. Maybe a better question would be, how did they know to send this to me, the most perfect person for this task? Had Pepsi sent a test to a more cynical person, they may have just seen it as free soda, and left it at that. I, on the other hand, am more than willing to take up the important responsibility of testing Diet 7-Up’s new and improved flavor. Unfortunately for Pepsi, sending these kits out will most likely convert only the person conducting the test, and that is only if they really like the soda. Not only will I take part in this critical task, but will announce the startling results* on this very web site, where millions and millions of readers will be… at The Onion’s site. However, the three or so people reading this site will be informed of the results. *Note, results may or may not be startling. Unfortunately, Pepsi had neglected to include a blindfold for this test. This is probably a good thing. I don’t want someone to walk in on me sitting at the computer wearing a blindfold. There really is no way to have someone not believe you were up to some bizarre, lemon-lime related deviant behavior. Despite the lack of anonymity, I was not going to let any bias stand in the way of making a level headed decision. I didn’t know whether I should start with the Diet 7-Up or end with it, so I compromised and put it in the middle. I also didn’t know if I should take a sip or two of each soda, or drink the whole can. A whole can seemed excessive for a taste test, but having three open cans of soda after sipping each one seemed even worse. I have had enough practice drinking cans of soda so I felt I could finish them all; plus drinking the entire can would give me the whole taste experience of each brand. They do suggest actually doing a blind test. As pumped as I am to take part in this, that sounded like a lot of effort. I did have my brother take two sips of the Diet 7-Up and he offered his controversial opinion, which will be revealed later. With everything set up, I was ready to take part in one of the most exciting events of my life. I also don’t like their usage of the word Lymon; it always reminds me of the pervy guy from Garfield. 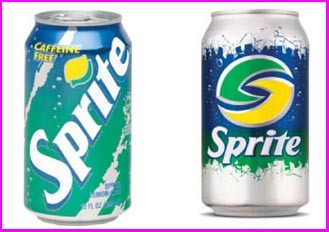 That aside, there is not too much to be said about Sprite Zero. It’s simple, and tastes good but not amazing. I tried to think of something to cleanse my palate between sodas. After drinking the first can, I figured milk would be a good, neutral flavor. Then I realized drinking a lemon-lime soda after drinking milk would be like drinking orange juice after you brush your teeth. I had no better ideas, so I just drank a lot of water and ate peppers. I was hesitant to try this, because I really wanted the soda to be amazing. Since Pepsi had gone to all this trouble to promote it, I would be saddened if it didn’t win the taste test. I boldly took a sip, and was pleased to discover that it does taste quite good. The first few sips were a bit underwhelming, as I was expecting to be floored by the more “natural” taste. My brother Eric described it as “okay” and “pretty good”. Quite a provocative stance to take. As I went on, finishing the can, the taste seemed to improve. It definitely is a more natural soda taste… very clean. While I don’t know if this makes it tastes better than the other sodas, it certainly makes it different. 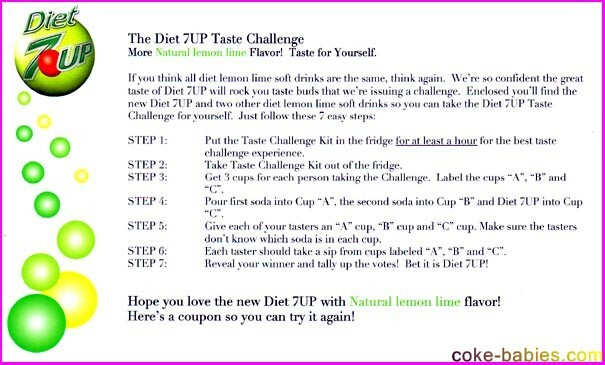 I am happy to say that I approve of Diet 7-Up. The final competitor was probably the weakest. It wasn’t bad at all (seeing a trend here? Lemon-lime sodas are kind of boring and hard to write about) but certainly not great. It is another of those sodas I wouldn’t turn down but wouldn’t go out of my way for. And by “out of my way” I mean “downstairs”. After my taste test adventure, I can not declare a clear winner. 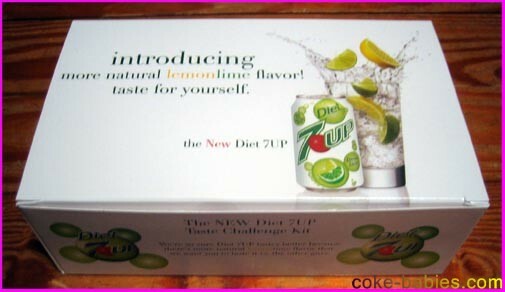 Diet 7-Up does indeed have a more natural, crisper taste. The one thing it lacks is a real “soda” taste. I guess when I drink soda I don’t want something to taste natural, I want the artificial variety. When I drink grape or orange soda, I don’t want natural flavors, I want the flavor equivalent of a neon sign. Even though I wasn’t blown away by the taste, I will forever hold Diet 7-Up in a positive light for being so awesome as to send out taste test kits. I can guarantee that I will be obtaining at least one bottle of it. I neglected to mention this earlier, but the kit also contained a coupon for a free bottle of Diet 7-Up. The joy this box has brought me almost never ceases. I am going to have to wrap this up right here, because I am becoming so emotionally overwhelmed that my teary eyes are making it hard to type.